Benny's a hipster, moving in and out of Manhattan's beat scene, aimless, maybe close to trouble. His sister Lelia, who looks less African-American than White, is vulnerable and about to fall in love. Hugh, their older brother, is a struggling singer whose agent, Rupert, may be the only person with faith in his talent. The story moves back and forth, like jazz, among the three of them and what seems at first to be separate lives. Lelia meets Tony, and lets herself hope this is true love. Then he meets Hugh and prejudice gives Tony an excuse to cut and run. Can family and friendship bring solace for her hurt, purpose for Benny, and belief in Hugh? Is life more than shadows? Primitive Cassavetes.Interesting, but no masterpeice 1959 was a landmark in the world of film.Several great directors of the classic era were releasing career capping classics that ranked among their best.Just a look at the titles is instructive, Hitchcock's North By Northwest, Billy Wilder's Some Like It Hot, Howard Hawks' Rio Bravo, Douglas Sirk's Imitation of Life.Add a couple from the previous year, Orson Welles' Touch of Evil, Hitch's Vertigo, and Nick Ray's Wind Across the Everglades, and you've got a pretty good summing up of what was possible within the classic Hollywood style. 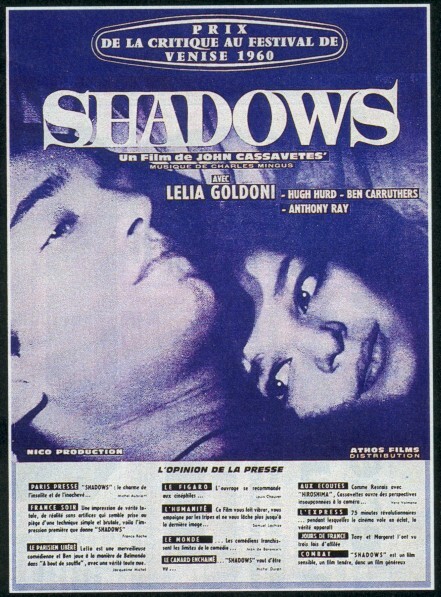 At the same time, two films appeared that hinted at a whole new way of making films.One was Jean-Luc Godard's Breathless, the other was John Cassavetes Shadows.The two films had certain things in common, largely improvised acting by non stars, handheld cameras, low budgets, and a certain youthful, jazzy swagger.In certain ways, though, they couldn't be farther apart.Godard was still a believer in the director as arbiter of style.He knew more about film than most Hollywood producers, and Breathless was filled with the iconography of the classic crime film.Cassavetes, on the other hand, was an actor, and a refugee from New York's underground theater scene.His first film shows him little impressed with the cinema, and a big believer in actors.Godard's film constantly references it's own artifice, whereas Shadows aims for a certain kind of naturalism. 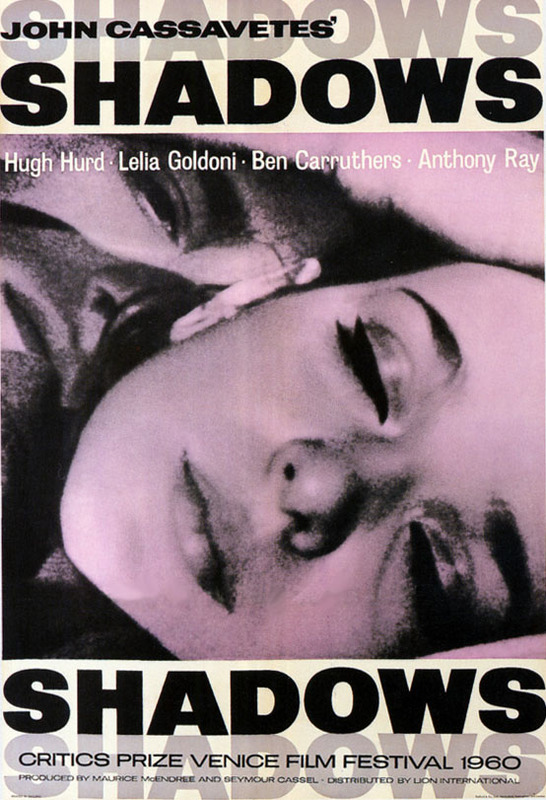 It doesn't reach it, mainly because naturalism is a myth, particularly in cinema.But it feels powerful, kinetic but lilting like the cool jazz on the score, certainly the main inspiration for the filmmaking style on display here.It ultimately doesn't hold together, mainly because Cassavetes' actors here are amateurish beatniks, where Cassavetes style requires strong, imaginative actors.His later work with Gena Rowlands, Ben Gazarra, and Peter Falk blows this out of the water.Due to the director's technical inexperience, some bits of dialogue had to be redubbed later, which defeats the freshness of the improvisation. Still it's fascinating to watch, both for the great moments (like the scene where Leila Goldoni talks about her dissapointment with losing her virginity) and to watch a groundbreaking artist finding his way.